Hot tubs are great for hydrotherapy and relaxation. The heart of your hot tub is the spa pump – making all the magic happen. Some larger spas may have up to 4 pumps – each serving a designated area or function. Some spa pumps are single speed, some are dual speed. Some spas have dedicated circulation pumps. 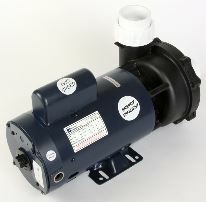 (Circulation pumps are generally 1 speed pumps designed for 24 hours continuous low flow.) If you find your spa pump (or pumps) not working, there are some basic troubleshooting steps you can take. Spa pumps can go bad for several reasons. 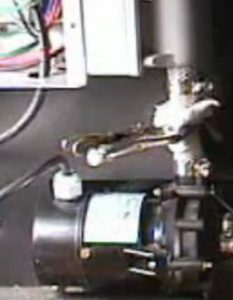 A pump can overheat, water can get into the motor and cause a short circuit, or it can simply wear out over time. Maintaining proper spa water balance is important to protect your spa’s equipment. If the pH is off, then you can have scale build up with low pH or too much alkalinity when the pH is high – which can corrode the pump parts. Pay attention to any leakage that occurs, especially near your spa pump. It could be that a union is simply not tight enough with the connection to the motor. Perhaps the o-ring within the union has deteriorated and is causing the leak – or the seal is leaking. Seals and o-rings are like car wiper blades – they wear out over time and will need replacing. However, they will wear faster when you have improper water chemistry. Get into the habit of checking the spa pumps when you refill your spa. Make sure there are no signs of leakage nor any calcium buildup. Fixing seals and o-rings is inexpensive but, left unchecked, the water may make its way into the spa motor. Once this happens, the front bearing will go out and you will probably get water in your motor windings. At this point, you will have no choice but to replace the much more expensive spa pump. Learn more about what to do if your hot tub pump is leaking. There are several components that make up the spa pump. You have the motor, the wet ends, the impellers, the capacitators, the seals, gaskets, o-rings and more. Before you, or a qualified technician, attempts to do any work on the pump, make sure the spa is off and the electricity is disconnected. You will need to determine if the problem is with a pump part -like the impeller jamming or a wet end needing replacement – or if you need to replace the entire pump. Generally, if the spa is older than 4 or 5 years and you have never replaced the pump – it is better to switch it all out. You will have less service issues and the newer one will probably operate more efficiently. It is important to note that new pumps do not come with the pump cord. Your existing cord may work – depending on the problems you have had. If you need a new one, note that there are several different types – like J&J, AMP, mini J&J, etc. – and be sure you order the correct one. While you should always have a trained professional working on your spa equipment, you can save money by buying your replacement spa pump online. Routine water maintenance, turning it off while not in use, and checking it for build up or leaks -will help you keep your equipment running smoother for longer.